The Multi Channel oscilloscope software has a modular structure, with Sources, I/Os and Sinks. Sources are modules that only generate data. The channels of instruments that are connected to the computer can be used as source, they generate the data that is measured by the hardware. The other source that is available is the software generator, which can create various signals from software that can be used in combination with measured signals. Sinks are modules that only accept data. Typical sinks are e.g. graphs and meters, they accept data and display it. Other sinks are the disk writer, to store data to disk and the sound sink, to make data audible through the sound system of the computer. These I/Os analyze the input data and extract specific information from it. 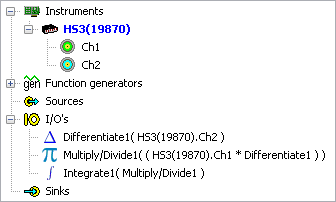 All measurement setups in the Multi Channel oscilloscope software are built from one or more sources, I/Os and sinks. These are simply connected to each other by dragging and dropping. Multiple I/Os can be used to form complex mathematical operations. In the image above, three I/Os are used to determine the area that is enclosed by two signals in XY mode.